The idyllic Greek seas with their crystal clear waters, impressive sea bottom and valuable undersea wealth make diving into a lifetime experience! Countless fish species, colorful corals and shells, sea anemones, sponges, starfish, seahorses, lazy turtles as well as fairy sea caves are just some of the surprises Greek water world has to offer! Except for this sea ark, impressive shipwrecks and sunken cities, falling asleep at the bottom of the Greek seas for years, are waiting to tell you legendary stories from the past! 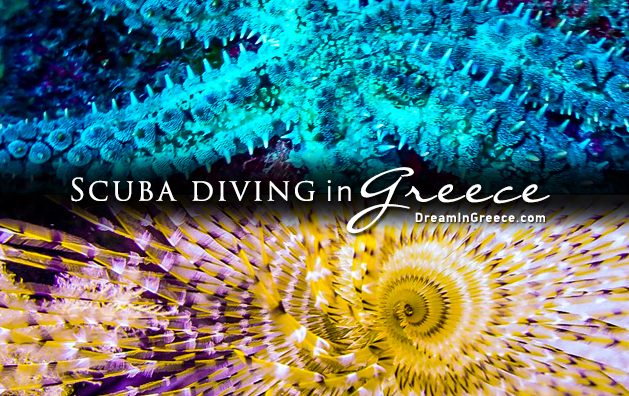 In every corner of Greece, you will find numerous specialized centers, to introduce you to the magical world of diving. Whichever area of the country you choose, exploring the Greek seabed will fascinate you, for sure! DreamInGreece.com proposes nine fascinating destinations, ideal for underwater explorations! Crete is an excellent destination for diving enthusiasts. In cosmopolitan Chania, you can find Omega Divers diving center; an ideal choice for both experienced, or not, divers. The fascinating underwater world of the island, with its spectacular morphology and the famous Cave of Elephants is waiting to reveal the hidden secrets of the aquatic universe! Do not miss Kalathàs and Paleóchora waters. Amongst the ideal diving destinations, there are the beautiful Cycladic islands, with the idyllic Amorgos standing out. On this island of the endless blue, countless underwater treasures are hidden: natural reefs, fairy caves, and shipwrecks waiting to tell you their own stories! In the bay of Aegiali, you will find Amorgos Diving Center, which specializes in providing various activities: diving, night diving, deep diving, nitrox etc. In Amorgos Chóra you will find the We Shall Sea Diving Center, which offers services for both inexperienced and advanced divers. Excellent destination for scuba diving is also the atmospheric island of Santorini. The volcanic nature of the island has given the underwater landscape a special charm, which is truly unique! In addition, the high content of salt in the water makes diving much more relaxed. If you want to live this unsurpassed experience of exploring the Santorinian sea bottom, you can contact either the Volcano Dive Center in Kamàri or the Mediterranean Dive Club in Períssa. Ios island is an alternative Cycladic destination for scuba diving lovers. In the beautiful Mylopótas beach, you can find Meltemi Dive Centre, which offers courses for every level of experience. The fabulous seabed of the island will thrill you! Ideal for scuba diving are also the Dodecanese islands. In the beautiful island of Rhodes, the hidden sea caves, the myriad marine species, and the forgotten shipwrecks perched on the bottom promise an exciting journey full of colors! At this atmospheric island, Knights’ island, as it is called, you will find several scuba diving schools, including Lepia Diving Centre. In the green island of Thassos, you can live unique diving experiences! In the southern part of the island, crystal clear waters and rich marine fauna make an excellent backdrop for underwater excursions. Throughout the island, you will find numerous diving centers with qualified and experienced personnel such as Popeye Diving Center. Popeye Diving Center operates in the beautiful city of Kavàla. The seabed of the Gulf of Kavàla is especially charming, as it is characterized by countless variations: sandy dunes succeed impressive rocky substrates, creating a stunning backdrop, with constant image alternations! Diving in Alexandroupolis is also an amazing experience. The specialized school Go Extreme Adventure Club is waiting to introduce you to the secrets of the northern Greek underwater world. It also provides the possibility of organizing privé excursions as well as special kinds of diving such as night diving, nitrox etc. Finally, for those visiting the Greek capital, numerous specialized diving centers can be found in Athens. Among them, there is Azzuro Diving Center which organizes both daily and 2 or 3-day diving trips, starting from Flisvos Marina.